To accelerate and augment their research possibilities, Grzegorz Pochwatko of the Institute of Psychology of the Polish Academy of Sciences in Warsaw called on WorldViz to implement a 5 user interactive laboratory using eye-tracked HMDs, Manus hand tracking gloves, full body tracking and BioPac physiological measuring devices. Because our VR development software Vizard supports a wide range of external inputs and is built primarily for researchers, it was a natural choice. In addition to providing and integrating all the necessary hardware, WorldViz created a custom Vizard application that allowed 4 users controlling tracked avatars to interact and grab objects in a scene, while visualizing each other’s eye tracking data and sending triggers to BioPac hardware for analysis of biofeedback data. At the same time, a 5th user could control the scene and get a top down display of everyone in the session. WorldViz also provided custom, modifiable scripts for each component of the system and a full training seminar on how to use and customize the various elements. The research opportunities available at this lab are incredibly exciting, and we can't wait to see what Dr. Pochwatko and his team do with the new capabilities. 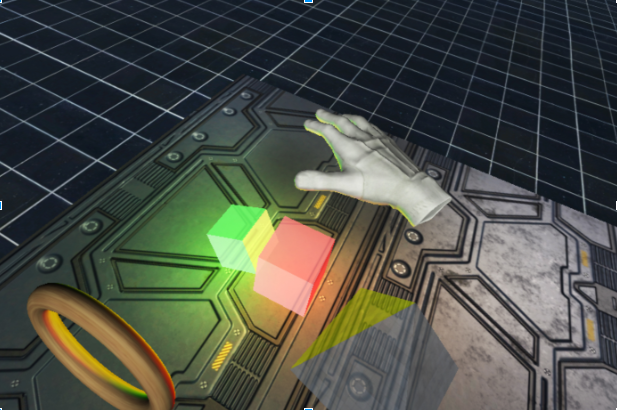 As collaborative VR environments become more popular, it's more important than ever to be able to conduct fine-grained research in collaborative VR with a range of data inputs. Interested in hearing more? Feel free to reach out if you're interested in setting up an advanced VR facility at your university or business.